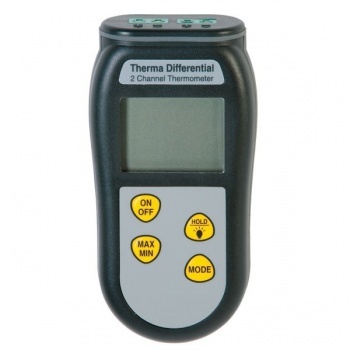 The NEW Therma Differential digital thermometer allows the user to use two type K thermocouple probes simultaneously. The display can be switched to show probe T1 or T2 temperature or the difference between probes T1 and T2 (T1-T2). 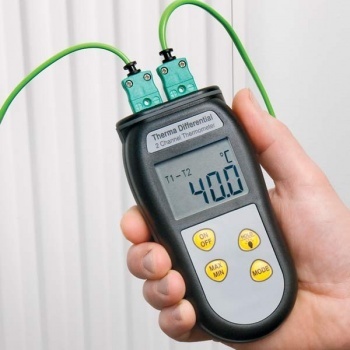 This allows, for example, the temperature drop across radiators or the temperature rise or fall of two items to be measured. I needed it before then, I realistically had 5 days. She said she would see what she could do. Not even 48 hours later and it arrived, complete with the bespoke longer probe. Brilliant job! Brilliant piece of equipment! Brilliant advice. Pay rise all round? !